Wow, I was very shocked to get a PM from member 'Stiefler07' with this nice bit of information. Fantomberry has gotten their hands on the first leak for the 5.0 OS series. I would love to hear the pros and cons with this new OS. From what I have gathered after installing, it is a pain to downgrade back to 4.6. So do this with caution. So you can all download the file by clicking here. Last edited by jlevy73; 06-25-2009 at 09:46 PM. 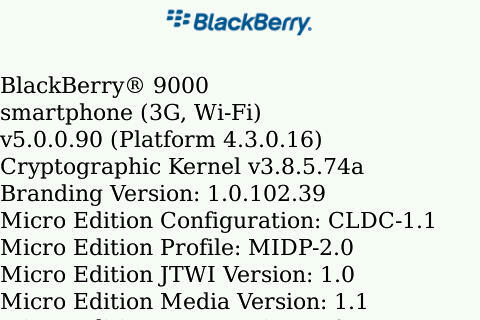 whoa wtf first an official for 8900 , now 5.0 for the bold. Ah man this is some BS with the storm I'm going back to my 8330.
a friend repporting problems to get service books any1 else? Pick North America or World Wide @ the top of the page. Pick your Service Provider from the list on the page. The OS is very fast, I get email and bbmessenger but not the browser. After re-sending service book the browser still not works, same story for bolt and opera.